Ashamed to contact service, so just put the wheel on the bike? It's time to learn to come out from this situation independently. Besides, it will save time and money. Insert the wheel into the fork tips and install such an effort eccentric clamp that will hold it in the fork. Do not overtighten as this may damage the clip or plug. 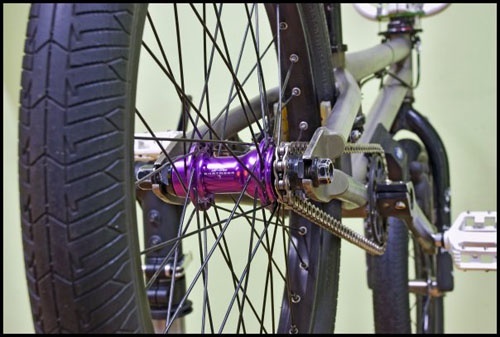 If the torque is too low, the wheel can fall out of the plugs, especially if your bikee disc brakes as they have a heavy load on the fork than rim brakes. Make sure that the wheel stood symmetrically without any bias relative to the lugs of the fork. If the wheel is centered properly, that is, without the "eights" and an umbrella, and when this fork bent, it is itself the wheel will stand straight. Otherwise, find the cause of the imbalance and eliminate it. Make sure that the wheel axle close to the end seated in the groove of the tip of the plug. The axis must lie at the bottom of the groove. If you have a bikee installed hydraulic brakes, while installing the wheel, carefully insert the brake disc between the brake pads in the caliper. If the pads are very small and to insert the disc between them does not work, in this case, gently spread the pads wide of a screwdriver or something like it. Big efforts not to apply to the brake pads left burrs. Turn the eccentric clamp lever at a right angle (90 degrees) so that it became almost parallel to the axis of the sleeve. Then tighten the nut until it stops but do not tighten it. Now turn the eccentric lever clamp so that it is parallel to the fork. Make sure that the effort was noticeable but not overly strong. If necessary, turn the nut to increase or decrease the compression level. The wheel is mounted. If your bikee set the brake type V-Brake, don't forget to tie them.